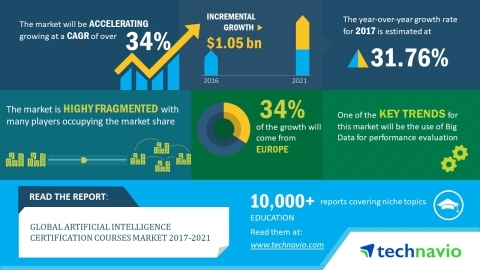 According to the market research report released by Technavio, the global artificial intelligence certification courses market is expected to accelerate at a CAGR of more than 34% during the forecast period. The growing demand for artificial intelligence professionals is one of the key factors triggering the growth of the market. This research report titled 'Global Artificial Intelligence Certification Courses Market 2017-2021' provides an in-depth analysis of the market in terms of revenue and emerging market trends. It also includes an up-to-date analysis and forecasts for various market segments and all geographical regions. In 2016, the blended learning segment accounted for 69% of the global market. The blended learning approach enhances the learning experience with an effective use of the set time of teachers and course participants. The use of Big Data for performance evaluation is an emerging trend in this market space. As course participants virtually engage with the course work, significant data are generated at a rapid pace. The enormous amount of data being generated by capturing the user search preferences along with their related industrial segments account for the use of Big Data. Through Big Data, evaluators or instructors perform a real-time data analysis to verify participants' presence and activities. A participant's performance is evaluated by considering his/her efforts and commitments. This will also help the service provider in understanding participants and tailor the course curriculum to suit his/her requirement. Participants' activities in terms of time of login and log out, and their presence during a week or topic sessions can be tracked and monitored. Therefore, a participant can be certified by considering these aspects.